I actually started these at the end of January, but they still count! These are "Annetralac" from Interweave Knits Holiday 2007. 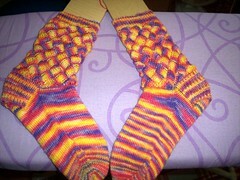 Knit in "Sunrise" by seacoast handpaints. Love the pattern! I cheated a bit for my next pair as it wasn't a random choice. 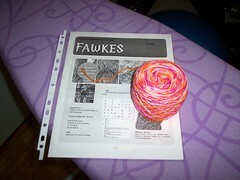 I'm knitting Fawkes in memory of Momma Monkey. These are beautiful! Keep up the good work!